When India’s Mars orbiter mission (MOM) lifted off from Sriharikota at 2.38 pm on Tuesday, it was a moment of joy for Jayant Patil and his colleagues at Larsen & Toubro (L&T). Patil heads the defence and aerospace business unit at L&T, which has been involved in India’s space programme for three decades. A symbol of self-reliance, India’s space endeavours are also a model for public-private partnership, with the industry providing as much as 80 per cent of the components and parts for the polar satellite launch vehicle. About 500 companies of all sizes work with Isro to manufacture components for its rockets and launch vehicles. So far, the role of private companies is restricted to the supply of components, but Isro Chairman K Radhakrishnan is batting for a wider role for the industry. The organisation is considering handing over assembly and integration of entire vehicles to select industries. Another company with a long-standing association with Isro is Pune-based Walchand Nagar Industries. Godrej & Boyce, too, has been making components for satellites and liquid propulsion engines of launch vehicles. “We have been associated with Isro since 1973. We have manufactured rocket motor casings and nozzles for the Mars mission,” said G K Pillai, chief executive of Walchandnagar Industries. “We have a separate aerospace business division responsible for the design, engineering and manufacture of equipment for the space sector. This has about 150 workmen, 50 engineers and world-class manufacturing and testing facilities. Due to an embargo, technology from developed countries was not available; through the past four decades, we have developed various manufacturing technologies and invested in relevant facilities,” Pillai added. Godrej & Boyce did not respond to an email query. 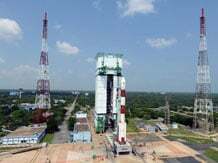 “Hindustan Aeronautics Ltd (HAL) delivered seven types of riveted structural assemblies and four types of welded propellant tankages for the polar satellite launch vehicle (PSLV-C25),” said HAL Chairman R K Tyagi. The company had also delivered a bare satellite structure and a deck panel to Isro, he added. Overall, 58 space missions have been planned for the 12th Plan period–33 satellite missions and 25 launch vehicle missions. The Plan outlay for these missions stands at Rs 39,750 crore, while non-Plan outlay is Rs 7,500 crore. To develop satellites, Isro is also tapping foreign markets. This could add to project portfolios of Indian companies.